On Wednesday of this week, the Federal Reserve will have an opportunity to change the nation's interest rates. 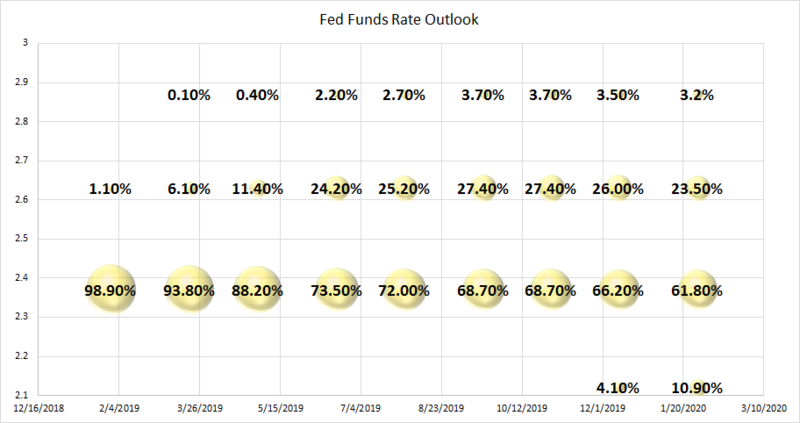 Though for the better part of 2018 the chatter suggested three more rate hikes were in the cards for the current year, neither the Fed nor traders believe we'll see one this time around. Inflation has been too tame and borrowing has been too lethargic to feasibly make borrowing less affordable and simultaneously crimp pricing power companies enjoy. Bolstering the case that the Fed won't do so on Wednesday: After a brief pause in a string of rate-hikes, the FOMC put one in place last month, right in front of what ended up being a record-breaking government shutdown. While the impact shutdowns aren't as grave as politicians may suggests, clearly they're of no help. As of the latest look, traders say there's a 99.8% chance the Federal Reserve will keep its target rate at between 2.25% and 2.5%. That still leaves plenty of time, and opportunity, for the FOMC to push rates up to its expected year-end target of between 2.5% and 3.0%, however, as the current 'dot plot' indicates. But, just for the record, those same traders aren't betting the Fed will be as aggressive in terms of rate-hikes this year as the Fed believes it will have to be. In fact, traders are mostly betting - with real money - that the Fed funds rate will still end the year at its current target of between 2.5% and 3.0%. Take a look at how the CME FedWatch data indicates futures traders are betting right now. 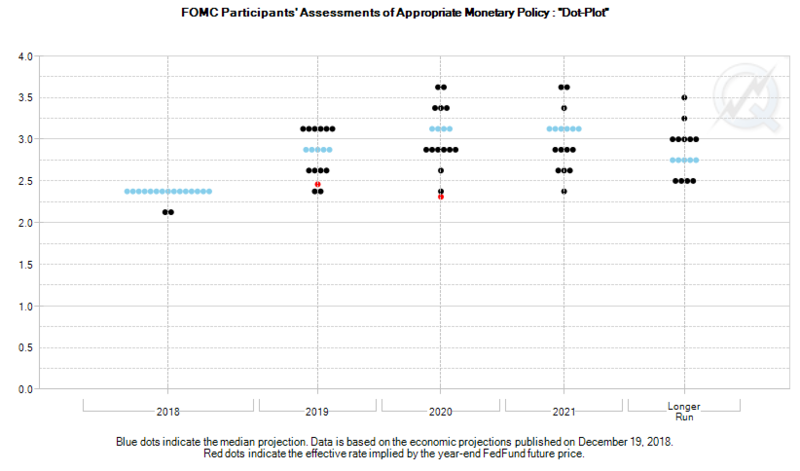 The red dot on the dot plot shows where the futures market is currently betting the Fed funds rate will be in late-2019, and in late 2020. Normally we'd see traders make their bets in near-perfect alignment with the FOMC. As for the takeaway, just know that for some reason, people don't think the Federal Reserve will need to be as aggressive with rate hikes this year or next as the FOMC itself thinks it will have to be. It would be curious to know what those speculators see that the Federal Reserve's voting governors don't see. Or, perhaps the new dot plot will look much different, broadly lowering the foreseen target range.